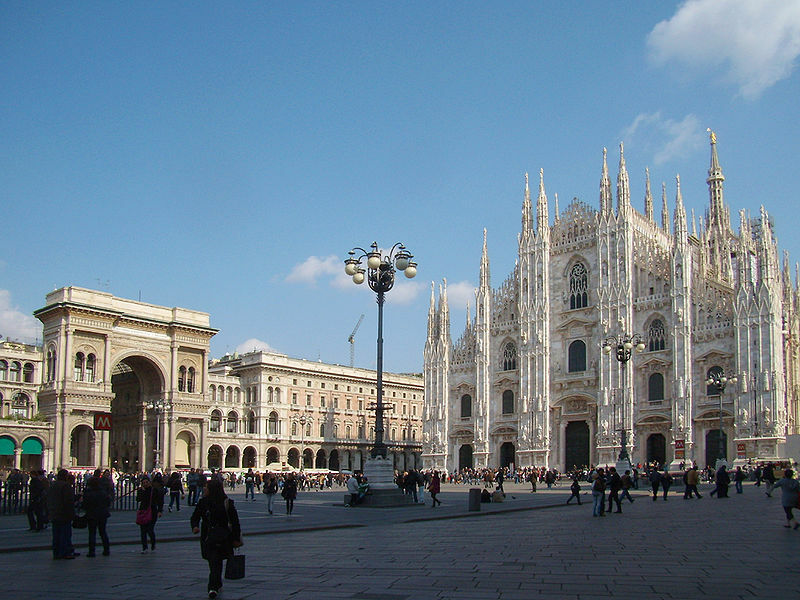 Milan Italy with tourist attractions and information. Milan Italy, in the north west, it is the second largest city after Rome, financially the most important city, capital of Lombardy region. The Duomo (Cathedral) is the symbol of the city, an undisputed masterpiece of Gothic architecture. It looks like a giant sand castle, with its tall spire of gilded copper on top of which stand out well 3,400 statues, including the beloved Madunina (Madonna). Inside, the space of a Latin cross shape make it one of the largest Churches in Europe (after St. Peter's Basilica in Rome and the Cathedral of Seville). The church of St. Ambrose, a little further east is dedicated to the patron of the city, welcomes the people since the fourth century and is one of the oldest Churches in Italy. The style is Lombard Romanesque, but it is interesting also for works of art that are kept there, including the Shrine of San Vittore in Ciel d'Oro. The crypt, still inside, contains the bodies of St. Ambrose, St. Gervase and St. Protaso. Although Milan is a large city, many of the main tourist attractions are within an easy and pleasant walk from one another. Traditionally, togheter with Paris, London and New York, Milan is a fashion capital and remains the marketplace for Italian fashion as well as cosmopolitan and multicultural city. Aficionados, supermodels and international paparazzi are coming upon the city twice a year for its spring and autumn fairs. From a tourist point of view, it is an interesting site, with numerous cultural monuments like, first of all, the Duomo and the Sforzesco Castle and museums: the Cenacolo, Civic Gallery, Civic Museum and Art Gallery, Archaeological Museum and lots more. The territory of Milan has six Regional Parks: Adda Nord Park, south Milan Agricultural Park, Groane Park, North Milan Park, Parco della Valle Lambro and the Lombard Park of the Ticino Valley. Half of the Province of Milan is characterized by agricultural land and rivers. Most of this territory is part of protected areas. Each of these habitats is characterized by natural scenery, different and very interesting architectural landscapes.